The 2010 smart fortwo pure is the cleverly named, bare-bones base trim for this coupe. Like all the fortwo trims, the pure is powered by a 1-liter three-cylinder engine that gets 33 city/41 highway mpg, produces 70 horsepower, and is paired with a five-speed automated manual transmission. The pure comes standard with electronic stability control with hill start assist and antilock brakes. There is no standard radio for the pure (it comes radio-ready with an antenna, two speakers, and an auxiliary input jack) and few features: a two-spoke leather steering wheel, leather gearshift knob, 12-volt outlet, tire pressure monitor system, rear wiper, smart key, fold-flat passenger seat, tire repair kit, drive lock (automatic locking system), power tailgate release, and 15-inch steel wheels. The 2010 smart fortwo passion adds some essentials to the basics of the pure trim. The passion upgrades with air conditioning with automatic temperature control, an AM/FM radio with an in-dash CD player and auxiliary input jack, a panoramic roof with sunscreen, power windows, power heated mirrors, a three-spoke leather sport steering wheel with paddle shifters and 15-inch, nine-spoke alloy wheels. Like all the fortwos, the passion’s powertrain is a 1.0-liter, three-cylinder engine (33 city/41 highway mpg, 70 horsepower) mated to a five-speed automated manual transmission. A Comfort Package with power steering, heated leather seats, foglights, and automatic headlamps is available for the passion. 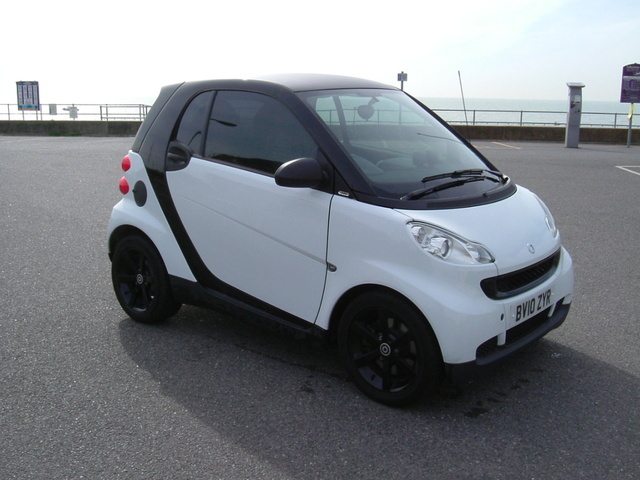 The 2010 smart fortwo passion cabrio shares drivetrain, interior, and exterior features with the fortwo passion and adds a fully automatic convertible top with a glass rear window. The passion cabrio also upgrades the audio system with an in-dash 6-CD player.